For this week’s homeschool science fun we made butter! We shook our jars for about five minutes but nothing seemed to be happening, so we untaped the jar lid and peeked. The cream had thickened but not changed substantially. The children were getting a bit tired of the shaking by now so I helped out and found the easiest way to keep up a rhythm was by jiggling my whole body around, ’90’s aerobics class style. 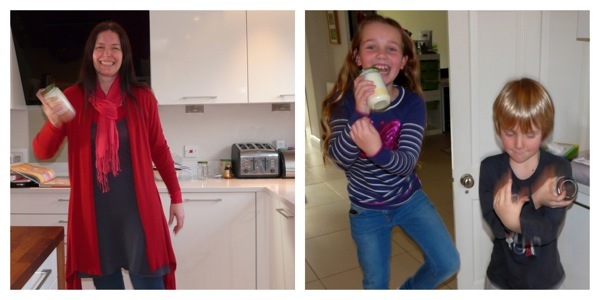 Which (once they’d picked themselves up from the floor laughing) inspired C and J to launch into Gangnam Style jar-shaking – they could have carried on all day! Eventually we heard and felt a soft, thudding sound in the jars. When we removed the lids this time, the cream had separated into a solid lump (butter) and a thin white liquid (buttermilk). J eagerly drank the buttermilk and declared it delicious (apparently his current audiobook, Charlotte’s Web had something to do with it :-)). 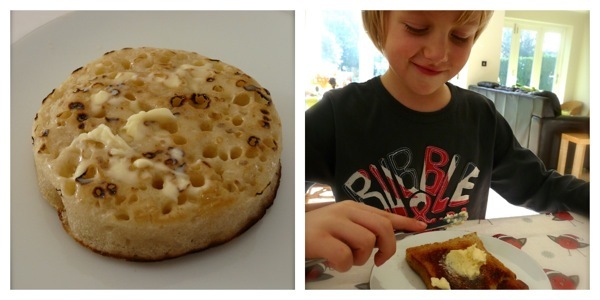 We spread our butter thickly on crumpets and toast – yum! Cream is an emulsion that has minute droplets of fat dispersed in water. 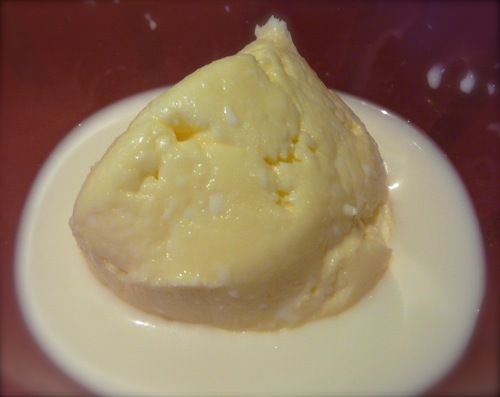 Shaking the cream makes the fat droplets stick together, forming butter. An emulsion is a type of colloid: it has tiny particles of one substance scattered through another. A colloid is a type of mixture: two or more substances jumbled together but not chemically combined. You can start with any kind of cream or even full fat milk. Sour cream apparently makes delicious butter, too. You can add vegetable oil or salt to vary the consistency and taste of your butter. If you use a plastic jar you can add a (clean) marble to speed up the separation process. Kitchen Science: Your Mother Was A Chemist explains in detail what colloids are, and gives lots of examples from nature. It also contains all sorts of other fascinating food science ideas. I can’t believe I had reached the age of forty-two without knowing how easy it is to make butter! For more inspiration, visit Adventures In Mommydom and take a look at all the wonderful science that’s been going on this week. I love how you went through the science behind this. Have you ever tried making butter with a marble in the jar? I’ve heard it makes faster. Thanks for hosting Science Sunday!